My family and I recently went to the island of Galveston (in Texas). After spending time in the ocean and eating a quick snack, we went for a walk. We entered the beautiful lobby inside the Hotel Galvez and ended up taking a two hour tour with the head of security when I studied the picture of Mr. Galvez. He gave us an enlightening history lesson regarding the ‘Great Storm’ of 1900, a huge hurricane killing about ten thousand people. The story of an orphanage managed by a loving nun broke my heart. When the water reached the top of their building, the nun tied a rope around her and the children in hope of them swimming. I cannot imagine the terror those they must have felt. One of the little girls is now a resident ghost in the hotel’s basement where she bounces her red ball to the fear of the guests. After hearing several other interesting things about this island, my interest in writing a ghost novel in Galveston has invaded my mind. I hope that you may have a similar experience with your research as well. I am finally writing another blog post. The last few days I’ve been busy working on both my adult ghost/spirit short story, The Enchanted Stone, and my YA time travel novel, Time Control: Deception. It is such a blessing to me when my characters talk to me as I write their stories, and it helps me to not dwell on my health problems. Now that I’m writing daily again, hopefully all of my tales will be published one day. Otherwise my ghosts will haunt me again. Did you know that I have a Spirit in my new house? Yep, and he/she opened up the light fixture while my son sat below. And where I’m currently sitting and writing this. 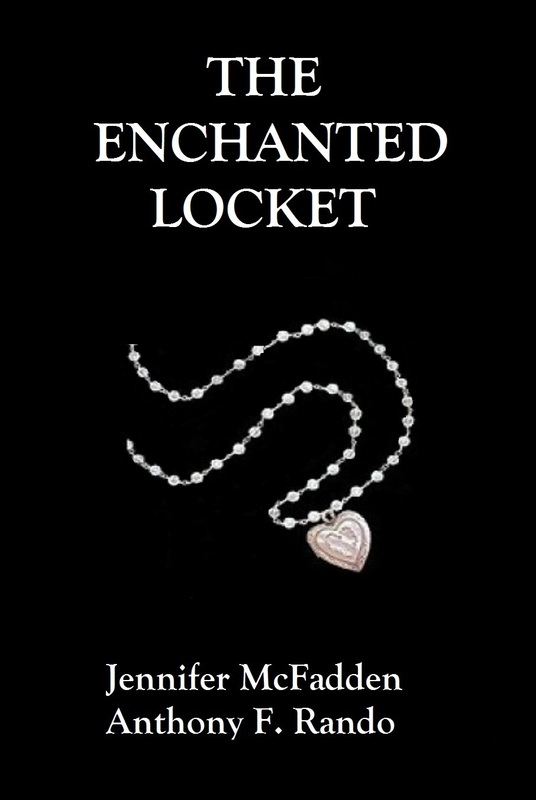 My co-author, Anthony F. Rando, and I are publishing THE ENCHANTED LOCKET as an eBook on November 1, 2011! We are also publishing it with Trafford Publishing as a hard cover in the fall. Lately I’ve gone back and forth between editing my adult ghost-mystery novel and writing the first draft of my young adult time travel book. You may be thinking, why? Or how can you work on both stories at the same time? When I need a break from editing Olivia’s interactions with her various ghosts, I switch gears and write from my sixteen-year-old Rachel’s perspective with traveling through time. It helps me stay focused writing and editing my two novels instead of reading thousands of wonderful writing blogs (though they are so helpful, I don’t write about my characters) and I feel better by the time my children come home from school. Do you work back and forth on two or more stories? Or are you better at finishing what you are working on before plotting your new world? Last month I found this image on thinkstock.com and thought of my mystery ghost novel, The Enchanted Locket. I downloaded it and asked my good friend and photographer, Judith McDonough, to include the image of my heart locket, title and author names so I could see if it worked for me. I love it! Now I need to finish editing this novel so this image can find a good home…. Recently I learned that reading through older, rougher versions of your writing is often a wealth of inspiration when you are revising your story in search of weak areas. A few nights ago I opened an old version that I kept on my small lap top and found one of my original drafts of The Enchanted Locket. After reading it, I realized that I could use some of it for one of the main ghost characters to be four-dimensional. I had written about three chapters from Emma, my young ghost, and her perspective on the events occurring before I went back to my original plot. Reading through the chapters I wrote with Emma and then weaving in just enough of her information to further the plot has been a wonderful writing experience that has enriched the storyline. I look forward to having fun weaving and editing both of my characters’ chapters during these next few weeks.